Tuna for Lunch- Case Study - AP Environmental Science! 2: Why is there a restriction for pregnant women and young children, but not the rest of the population? Mercury could affect the baby, and cause damage to little kids. 3: Do pregnant women have to avoid all fish? Explain your answer. No not all pregnant woman have to avoid fish because it could only contain small amounts of Mercury in their body. 4: Should Amanda have avoided the pan-seared tuna for lunch? Yes she should have because that tuna contained a lot Mercury. 5: Why is eating fish good for you? Do you want to avoid fish all together? Why or why not? Fish is good for you because it gives you a lot of vitamins and protein that is good for the body. You don't want to avoid fish all together because sometimes fish is a better choice than other meat. 2: How does the Mercury end in fish? DRAW a flow chart following the Mercury path. Fish takes in Mercury through the contamination of the water. 3: Where in the United States are Mercury wet deposition levels highest? What do you think explains this pattern? In Missouri, Arkansas, Tennessee and Florida due to the fact that they all have a lot of coal-burning power plants. 4: The EPA criterion for human health is 0.3 ug/g. Which fish species have average concentrations that exceed the EPA limits? Largemouth and Spotted Bass. 5: The concern level for piscivorous (fish-eating) mammals is 0.1 Hg ug/g. Which fish species have average mercury concentrations that exceed this limit? 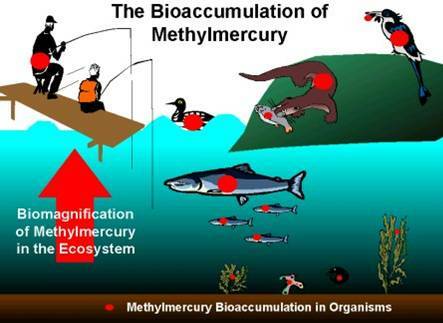 Why is the mercury level for piscivorous mammals lower than the level for human health? Trout and bass exceed the limit. Mercury levels are lower in human health because the animal might have not been able to resist it like humans do. 6: Should you be concerned about mercury toxicity if you catch and eat a largemouth bass in a local lake? Why or why not? Yes since largemouth bass have a high level of mercury toxicity. 7: In which samples were mercury concentrations the highest (fish, streams, or sediment)? Why do you think this is?Sediments because it can be in the ground and water absorbing in more Mercury. 3. Start with phytoplankton (algae) as the base of your web and then build up the food chain. 2: Label the species in your food chain as either high (>100 ug/kg), medium (20-100 ug/kg), or low (below 20 ug/kg) mercury concentrations. Which types of animals have the highest levels of mercury? Which types of animals have the lowest? Why do you think this is? The whale have a higher level of mercury because it is on the top of the food chain meaning every animal below him has mercury. The lowest would be phytoplankton, since they are at the bottom of the food chain just beginning the increase in mercury level. 1: Imagine you are Tara. Write a letter to your friend Amanda explaining what you have learned about mercury. Be sure to convey the aspects of your learning that will be most useful to Amanda. I am writing to you to let you know about a toxic named Mercury. It's the only metal that is a liquid but it is very dangerous to organisms including HUMANS! But mainly there has been level of mercury being founded in fish. The problem with that is the bigger the fish the more mercury it has. 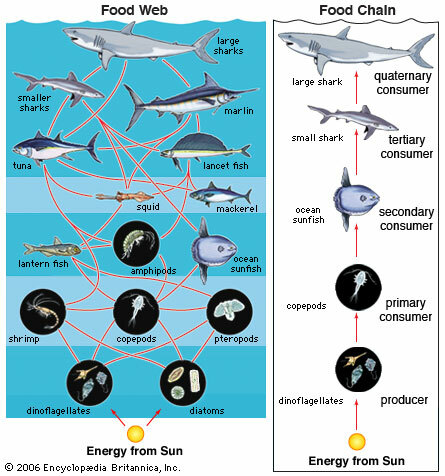 Since it is on top of the food chain those animals would be 10x more mercury than a bottom of the food chain animal like plankton. As the energy rises in the chain so does the mercury levels. Sometimes mercury can get into the air and water as well. 2: Find two other samples of compounds that biomagnify. Explain how each compound and/or toxin enters the biosphere and what impacts it has on living organisms in general and humans in particular. DDT- It enters into the biosphere from the spraying of humans into their crops. It causes headaches, vomiting, confusion and nausea. Cyanide- It enters into the biosphere by putting it into water. It causes miscarriages.